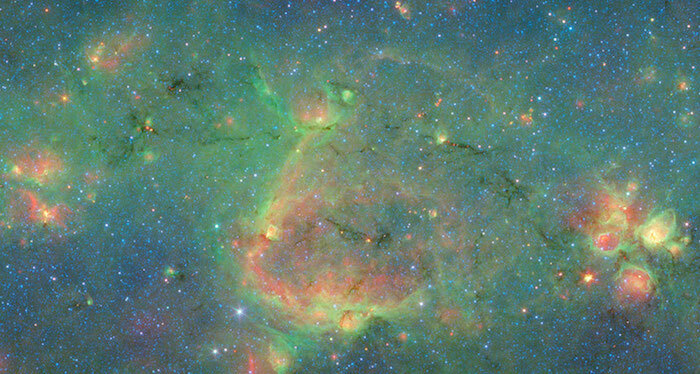 BARING BONES One of six bone candidates, seen silhouetted in this Spitzer Space Telescope image, lies about 11,000 light-years away; it is roughly 140 light-years long and 0.52 light-years wide. A galactic skeleton of dark interstellar gas tendrils might help map the scaffolding of our galaxy, a new study suggests. Six of these “bones,” each hundreds of light-years long and a fraction of a light-year wide, appear to lie along nearby spiral arms of gas and stars that wind around the Milky Way. The thinness of the bones potentially provides a precise tool for tracing the larger framework of our galaxy, a task that is fiendishly difficult for astronomers trapped inside the Milky Way. “Bones will not be useful just by themselves,” says study coauthor Catherine Zucker, a graduate student at the Harvard-Smithsonian Center for Astrophysics in Cambridge, Mass. But combined with other mapping methods, “they provide a way to pin down the locations of spiral arms.” The research appears in the Dec. 10 Astrophysical Journal. Much of what astronomers know about the Milky Way’s big picture comes from measuring the speeds of gas clouds and, along with some assumptions about how the galaxy rotates, translating those speeds into distances. The Milky Way is a spiral galaxy, but whether it has two arms or four, whether those arms wrap all the way around the galaxy, and even the extent of the solar system’s arm, are up for debate. The structure of the Milky Way “is one of the hardest things to measure in astronomy,” says James Jackson, an astronomer at Boston University. In 2010, Jackson reported the discovery of the first known Milky Way bone, a dense, dark ribbon of gas and dust hundreds of light-years long and roughly 1 light-year wide. Nicknamed Nessie, after the mythical creature lurking within the waters of Loch Ness in Scotland, it lies about 10,000 light-years away in the direction of the galactic center and along a neighboring arm known as Scutum-Centaurus. Astronomer Alyssa Goodman, also of the Center for Astrophysics and coauthor of the 2015 study, proposed that Nessie could be a “spine” of the Scutum-Centaurus arm. Because Nessie is so much denser and more compact than the relatively fluffy nebulas and star clusters that surround it, this spine and others like it could be more precise tracers of the larger galactic framework. “It’s not a crazy idea,” says Jackson. Recent computer simulations suggest that lots of these bones should form along the arms of a spiral galaxy. The bones might be related to giant molecular clouds — massive star-forming factories that preferentially reside within spiral arms. Intense radiation and winds from stars forming within the bones quickly take their toll, blowing the bones apart after roughly 10 million years. “They get chopped up pretty quickly,” says Jackson. Zucker’s six bone candidates show that Nessie isn’t alone, and, like Nessie, these bones appear to lie along spiral arms. But she also stresses that her study is a proof of concept. The researchers narrowed their search to known nearby spiral arms just to see if the filaments existed and if they aligned with the arms. “Right now, it’s a lot easier to identify bones along major spiral features,” Zucker says. She and her colleagues now plan to widen their search. “We think that bones could form anywhere in a spiral galaxy,” says Zucker. That’s why bones by themselves can’t solve all the problems of mapping the galaxy. But combining bones with other tracers of spiral structure might help resolve discrepancies in maps of the galaxy. With a catalog of hundreds of bones, and the help of other cosmic cartography tools, astronomers hope to better understand how our galactic home is built.